In The Demon-Haunted World, Carl Sagan starts off explaining how science can be viewed in both good ways and bad. For example, science makes it possible to increase the length of human life,however, then science also has to find a way to provide food for these tens of billions of people. In this book Carl Sagan also points out that every science also has a pseudoscientific version. Some examples would include, chemistry versus alchemy, psychiatry versus parapsychology, and astronomy versus astrology. Sagan also gets into UFOs and aliens as well as faith healings and other psuedoscience topics in The Demon-Haunted World. A major point that Sagan makes in this book is how can a country, like the United States, that has been in the center of so many amazing scientific discoveries, now be trailing behind other countries when it comes to scientific knowkedge among students? He partially blames this on rapid change in knowledge base. 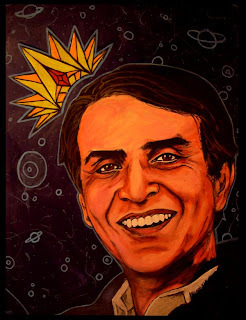 Carl Sagan was sure to emphasize his points with striking evidence. For example, he shares that 50% of Americans do not know that the Earth revolves aound the sun once a year and that 65% of adults do not know that antibiotics kill on bacteria and viruses. My favorite part of the book was definitely when Sagan got into UFOs and aliens. Being a fanatic of scary movies, like The Fourth Kind, and shows, like Unsolved Mysteries, I really enjoyed getting into this topic and learning about his opinions. Sagan's big question was, how can there be an advanced race capable of traveling light years, yet have such little knowledge about things like biology that they need to use humans to conduct experiments? Carl Sagan is definitely a skeptic of UFOs and aliens and points out that UFO sightings increased around the same time the military was transitioning from bombing to missiles, which created streaks of light that were very fast moving. Since Sagan does not believe in UFOs or any of the abduction stories, he and I do not really see eye to eye, however, it was really great reading his opinions and the evidence he has against the stories. This book is very relatable to our class because Carl Sagan is basically trying to disprove psuedoscience with science. He is pretty much a skeptic of everything we have been learninan g about and writing our blog posts on. Sagan even believes in a "Baloney Dectection Kit." This bulleted list pretty much explains how to think skeptically when it comes to these topics. Some points that are made are to make sure that where ever possible there must be independent confirmation of facts and if there is a chain of argument, every link must work. Overall, this was a great book. Although I do not agree with all of Carl Sagan's ideas and ways of thinking, I do believe he showed a lot of support and evidence for his beliefs. There are some parts of psuedoscience I do not agree with, but there are some I am not sure about and find very interesting and this book as well as our class have helped me realize that. I think that many people could relate to this even outside of class. There are all kinds of psuedoscience ideas all around us that are big controversies. Things like aliens and UFOs are portrayed all over the media on TV and in movies all the time. I guess it is just up to each individual person whether or not to believe.